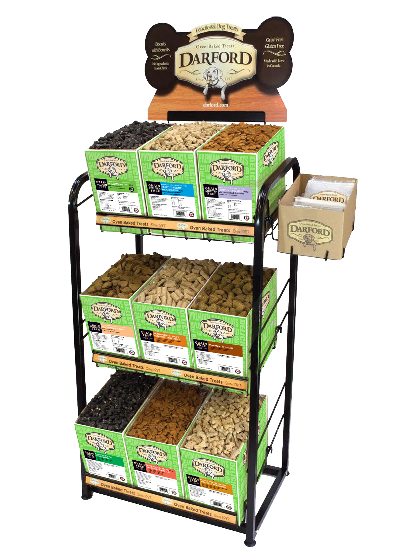 Darford introduces a brand new line of treats, a smaller bulk box and a new size treat in its premium Grain Free Functional line—and all were launched at Global Pet Expo 2016. The Naturals Wheat Free line in bulk offers three new flavors of wheat-free treats: Bacon, Cheddar Cheese and Peanut Butter. These new cookie-shaped treats are made with all natural ingredients and rye flour instead of wheat flour. This makes them perfect for those dogs with wheat sensitivities. The combination of barley, oats, rye and rice flour offer a nutrient-packed line up and are excellent sources of dietary fiber, which can help lower cholesterol and benefit intestinal health. This is why Darford has also launched new sizes in its premium Grain Free Functional line. Two flavors—Healthy Skin & Coat and Healthy Hip & Joint—are now available in the new regular-size signature heart shape. Already available in the mini hearts, the new larger size will provide large dogs with a more usable, and healthy, treat option. Darford’s Healthy Skin & Coat treats feature Omega 3 and 6 fatty acids. The Healthy Hip & Joint treats have added glucosamine and chondroitin. Other Grain Free Functional SKUs include Healthy Weight Management and Healthy Digestion, both available in minis. New bulk boxes have already begun shipping to distribution as of April 1, 2016. Darford has been baking premium natural dog treats since 1987. Darford uses only the best ingredients, follows rigorous quality control guidelines and bakes all of its treats in its own ovens—right here in Canada.